There are several key cost reports in vintrace that this page will detail so that you can determine an accurate Cost of Goods Sold (COGS) for your accounting package. 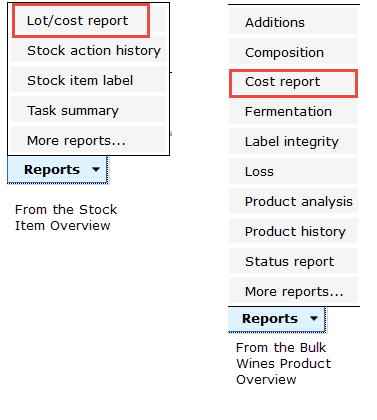 From any wine or stock costing tab, you will notice a Costing report button. This will produce a detailed PDF cost breakdown showing the individual cost categories as well as a per unit cost. You will also see a history of all cost events that have impacted the wine or stock. To see costing information across multiple bulk wines, finished goods, dry goods or chemicals, you can use the Inventory stock report located under Reports> Inventory. It would be most typical to run this report at the end of a month as it creates a snapshot of your inventory as of the close of business. This report exports as a PDF or CSV so you can readily manipulate for import into a third-party system. By default only a unit cost and total cost are provided however you can select the Breakout costing option (only available for the CSV output format) to show a column for each costing category (Overheads, Storage, Additions etc). By using the Stock type and/or Stock category you can limit the output to just a particular set of inventory items i.e. Stock type = Wine Batch will show just bulk wine. There are additional filters available: Include zero-level stock, Group by stock code and Include inactive stock items. Use of one or more of these extra switches will expand the number of stock items included in the report. Note: The Group By options are only available when using the PDF output. 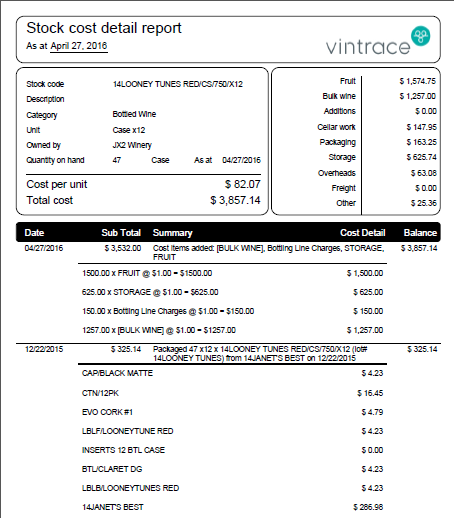 This report allows you to see the costing events between two dates and the impact that has had on the unit cost for a particular bulk wine. It’s located under Reports> Bulk Wine. Select the date range and the wine batch and Generate. This report shows, for all bulk wines selected via the filters, an opening and closing balance and all the cost differentials for the selected period of time. It helps reconcile how costing has been impacted by cost adjustments and winery operations for any given period and can help by providing you enough information to journal COGS adjustments to your accounting package. Select your date range and optionally a particular batch or owner. The Cost rate allows you to report in Total $ or $/gal or $/L.The output format of this report is CSV that can be viewed in Excel. Tip: this report may take some time to run so it’s a good one to run via the Email option that will send the report to you when done.